From his pet hippos roaming Colombia to the grisly details of his death, these fascinating Pablo Escobar facts reveal history's most feared drug lord. Pablo Escobar (left), next to an image of Wagner Moura, who plays Escobar on the show Narcos. If you haven’t yet seen the Netflix original series Narcos, stop what you’re doing and pull out your laptop right now. 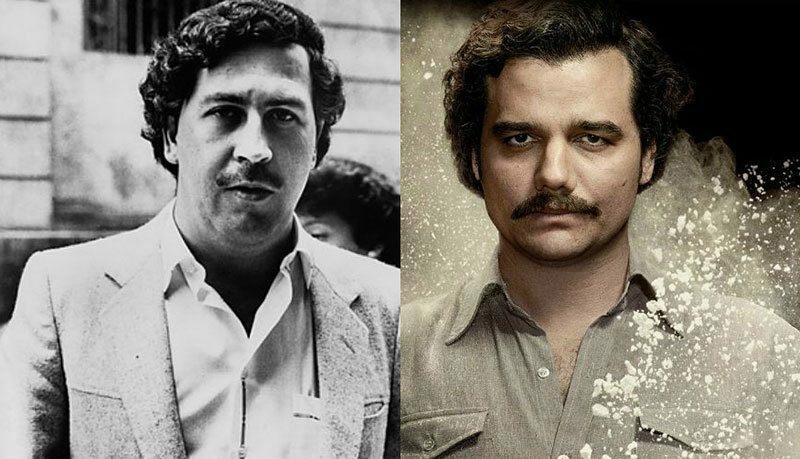 Narcos stars Wagner Moura, Maurice Compote, and Boyd Holbrook, and details the rise of Pablo Escobar, the devastating Colombian kingpin who ruled the world’s most complex and far-reaching drug trade — and killed thousands in the process. 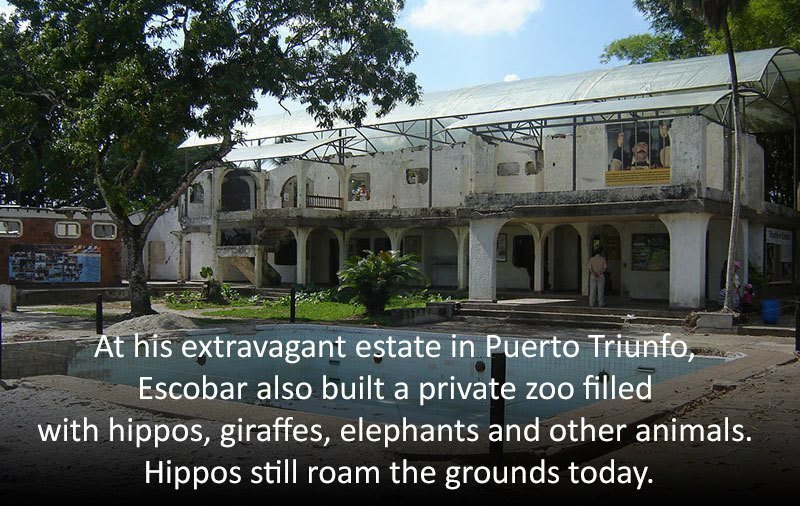 At his extravagant estate in Puerto Triunfo, Escobar also built a private zoo filled with hippos, giraffes, elephants, and other animals. Hippos still roam the grounds today. 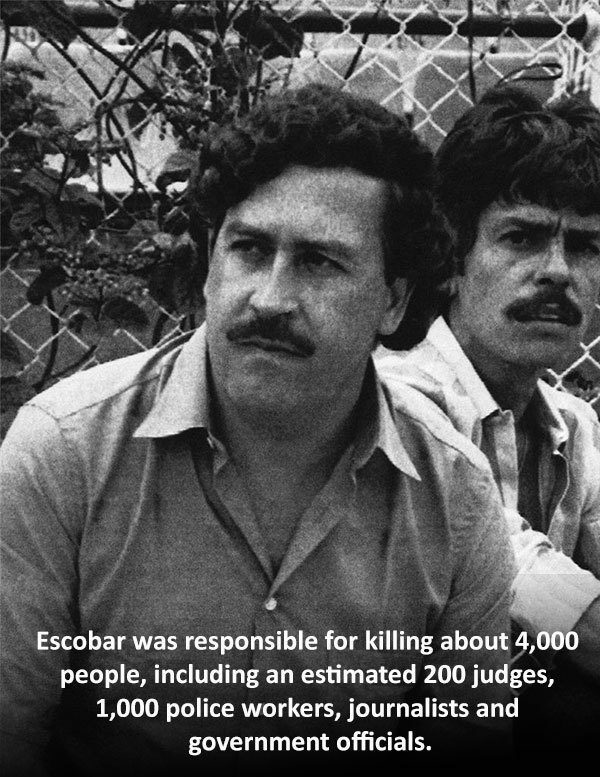 Escobar was responsible for killing about 4,000 people, including an estimated 200 judges and 1,000 police, journalists, and government officials. 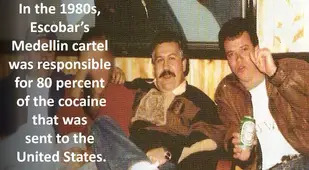 In the 1980s, Escobar's Medellin cartel was responsible for 80 percent of the cocaine that was sent to the United States. Before getting into the drug trade, Escobar sold stolen tombstones to smugglers and was also into the business of stealing cars. 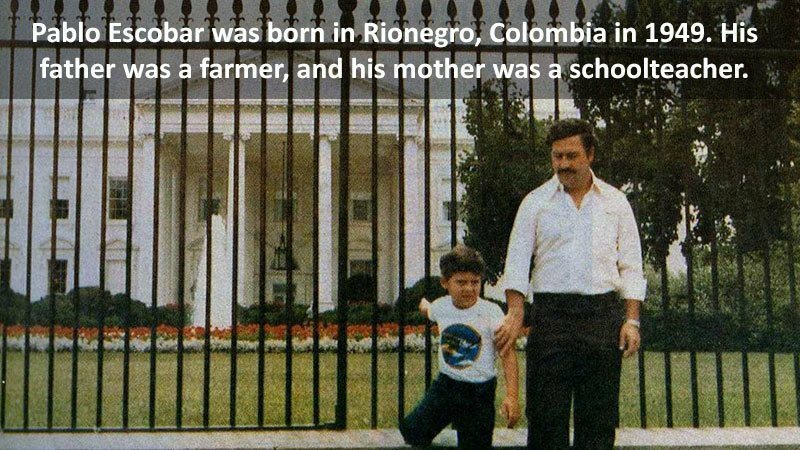 Pablo Escobar was born in Rionegro, Colombia in 1949. His father was a farmer, and his mother was a schoolteacher. In 1976, a 27-year-old Pablo Escobar married Maria Victoria Henao Vellejo, who was then just 15. 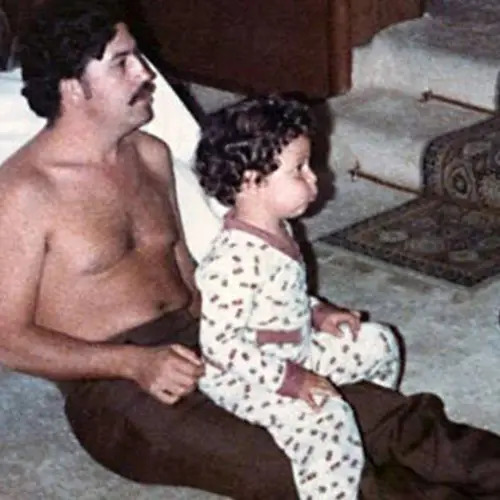 While the Escobar family was in hiding, Pablo's daughter, Manuela, got sick. To keep her warm, Escobar burned about two million dolllars. Pablo Escobar bought a Learjet specifically for flying his cash. Escobar is said to have smuggled cocaine into plane tires. Depending on how much product pilots flew, they could earn as much $500,000 per day. In an attempt to change the laws of extradition, Escobar offered to pay Colombia's debt--an estimated 10 billion dollars. Escobar spent around $2,500 a month on rubber bands used to hold his money. Escobar's earnings peaked at an estimated 30 billion dollars. Escobar made the Forbes' billionaires list of the world's richest people seven years in a row beginning in 1987 and peaked at number seven in 1989. In the late 1980s, Colombian authorities seized some of Escobar's enormous fleet, including 142 planes, 20 helicopters, 32 yachts, and 141 homes and offices. 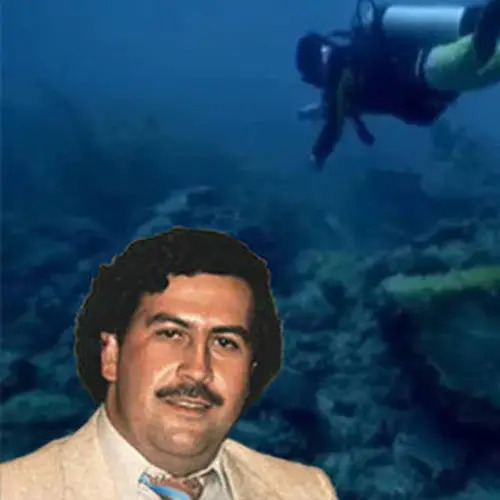 Escobar's business was so big and so scrutinized that in addition to planes, helicopters, cars, trucks, and boats, he even bought two submarines for transporting his cocaine into the United States. 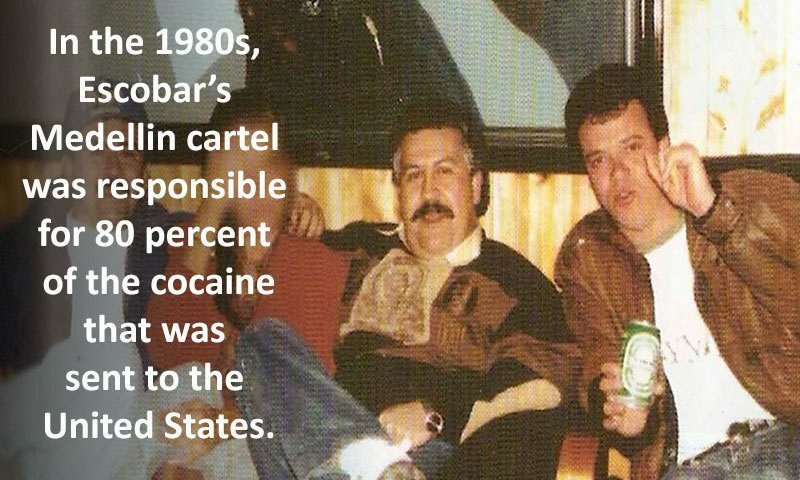 At the height of the drug trade, Escobar smuggled up to 15 tons of cocaine each day. 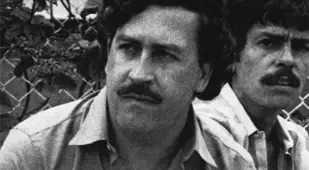 Pablo Escobar's support of the poor earned him the nickname "Robin Hood." 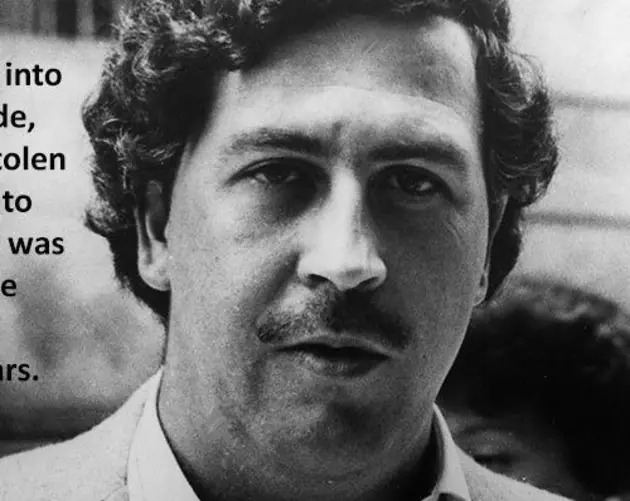 Other popular nicknames for Escobar were "Don Pablo" and "El Patron." Among the possessions that authorities found in Escobar's home was a Spanish translation of the self-help classic, The Power Of Positive Thinking. About ten percent of Escobar's earnings were lost to spoilage. Rats likely consumed a bulk of those bills. Escobar's luxury prison was referred to as "La Caterdal" (aka the Cathedral). La Catedral housed a casino, a nightclub, and even a spa. 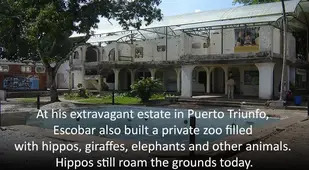 Following his death, Escobar's lavish Colombian estate was transformed into a theme park featuring animals, life-sized dinosaur models, Escobar's collection of classic cars, and more. 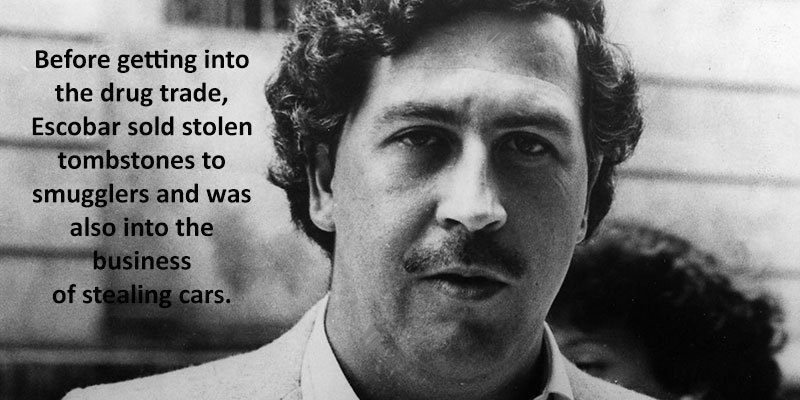 Pablo Escobar's greatest fear was extradition. No matter what happened, he didn't want to spend his final years in an American jail cell. Despite his horrific business dealings, Escobar did fund a number of programs to help Colombia's poor residents. He gave money to churches and hospitals, established food programs, built parks and football stadiums, and created a barrio. Escobar used his extraordinary wealth and popularity to get himself elected to Colombia's Congress. The biggest single cocaine shipment Escobar ever made to the United States weighed a whopping 51,000 pounds. 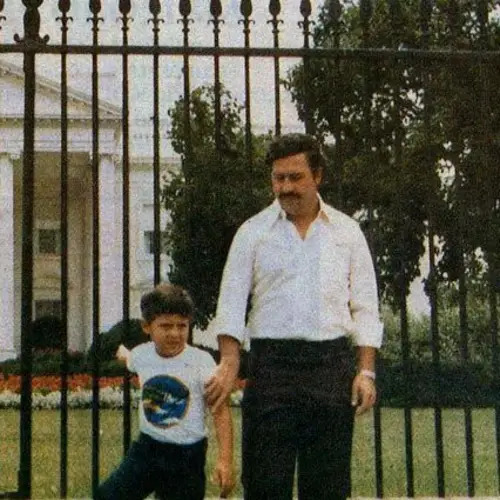 Pablo Escobar was gunned down at the age of 44. Some people speculate that the wound was self-inflicted. About 25,000 people -- including many of the poor Colombians to whom Escobar had personally distributed money -- attended his burial in Medellin. 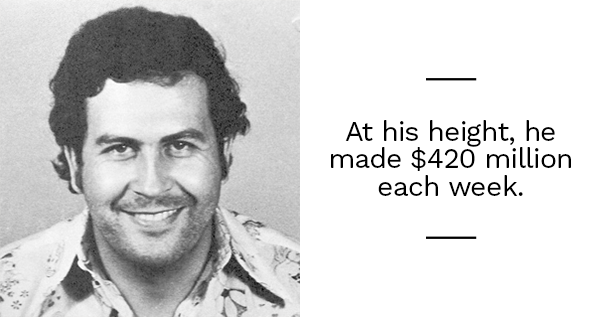 Enjoy these fascinating Pablo Escobar facts? Then check out our other posts on amazing facts and then check out these insane narco instagram photos from Mexico's most feared cartels. And before you go, be sure to like All That's Interesting on Facebook!